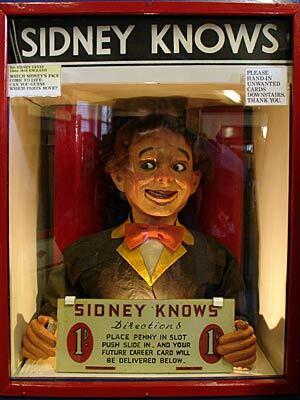 There's a small collection of old penny-in-the-slot working models and novelty games from the piers and arcades of the British seaside in the Rye Heritage Centre on Strand Quay (above the Rye Tourist Information Office). The many models include the Laughing Sailor, the Executioner, the Haunted Churchyard and rarer examples like the Beauty Parade and the Haunted Grange. All the machines are operated by the old English penny that stopped circulation in 1971.